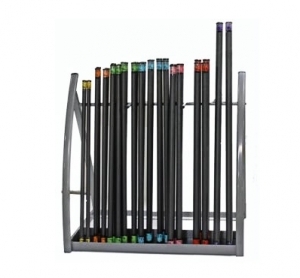 Our Bar features a solid steel core for evenly distributed weight, and is covered in high density resilient black foam for long lasting durability and added comfort. 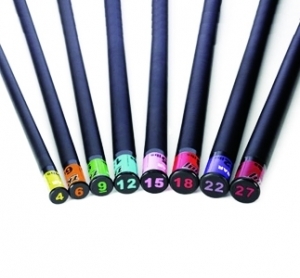 Each bar exhibits a unique, color-coded rubber numbered end cap in addition to a colored label sleeve. This Bar is ideal for performing various exercises including sit-ups, squats, lunges and upper body exercises and is great for toning and conditioning. Our Aerobic Bar Club Pack delivers 32 bars in our most popular sizes and an attractive display/storage rack, all in one package. Each bar has a color coded cap indicating its weight, and all bars are covered in commercial quality high density foam. Great for schools and group exercise classes. Each set contains a display rack and the following bars: 2 x 4lb., 4 x 6 lb., 8 x 9 lb., 8 x 12 lb., 4 x 15 lb., 4 x 18 lb., 2 x 22 lb. 1 year warranty against breakage.